Albuquerque, New Mexico – November 15, 2016 – Optomec, a leading global supplier of production grade additive manufacturing systems for 3D Printed Metals and 3D Printed Electronics announced today that the company will feature its new LENS Machine Tool series for 3D printed metals and Aerosol Jet 3D printers for functional Electronics at the FormNext show in Frankfurt, Germany November 15-18. Optomec will be located in Stand 3.1- D05. The new LENS Machine Tool Series integrates Optomec’s robust LENS metal additive manufacturing technology into conventional CNC Vertical Milling platforms, resulting in breakthrough price points as well as the industry’s first Hybrid VMC Controlled-Atmosphere System. 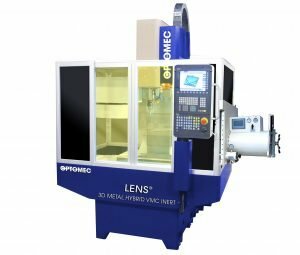 Optomec’s new LENS Machine Tool series combines high-quality CNC platforms from Fryer Machine Systems with industry-proven LENS Print Engine technology to bring metal additive manufacturing capabilities to a broader market. It includes three standard configurations, all designed to reduce manufacturing process times and costs while enabling improved end product performance and rapid design changes. The LENS 3D Metal Additive System provides high-value, open atmosphere processing at the lowest cost. With pricing starting just below, $250,000 this machine is a breakthrough both in pricing and functionality. The second configuration offered is the LENS 3D Metal Hybrid VMC System, which combines additive and subtractive operations on the same machine at a low cost. Thirdly, the LENS 3D Metal Hybrid VMC Inert System is an industry first, providing an atmosphere-controlled environment to extend hybrid manufacturing capabilities for reactive metals and aluminum. The LENS 3D Metal Hybrid VMC Inert System is the first of its kind for the metal working industry. The system can maintain oxygen and moisture levels at less than 40 ppm by replacing the upper enclosure of the CNC machine with an Optomec proprietary hermitically-sealed chamber and gas purification system. Pricing for the LENS Machine Tool Series starts at $249,500 for the LENS 3D Metal Additive System. The full product line was unveiled at IMTS 2016 and first customer shipments will commence in Q1 2017. Optomec is a privately-held, rapidly growing supplier of Additive Manufacturing systems. Optomec’s patented Aerosol Jet Systems for printed electronics and LENS 3D Printers for metal components are used by industry to reduce product cost and improve performance. Together, these unique printing solutions work with the broadest spectrum of functional materials, ranging from electronic inks to structural metals and even biological matter. Optomec has more than 200 marquee customers around the world, targeting production applications in the electronics, energy, life sciences and aerospace industries. For more information about Optomec, visit https://www.optomec.com/. The LENS Machine Tool Series integrates Optomec’s industry-proven, metal 3D printing technology into standard CNC machine tool platforms providing lower-cost, higher-value metal additive manufacturing and hybrid solutions.